Thanks, thats a cool feature. 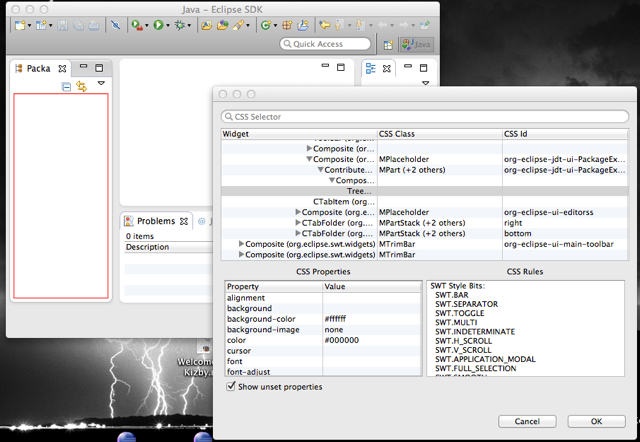 I used in in my last Eclipse 4 training and the participants really liked it. Ctrl-Alt-F4 is actually a really bad shortcut on Linux, it switches to a text concole. I made a mistake in the shortcut: it’s actually Shift-Alt-F4. Sorry for the confusion! The spy is really interesting. But also on windows not the best shortcut. I would like to start it within an rcp application. 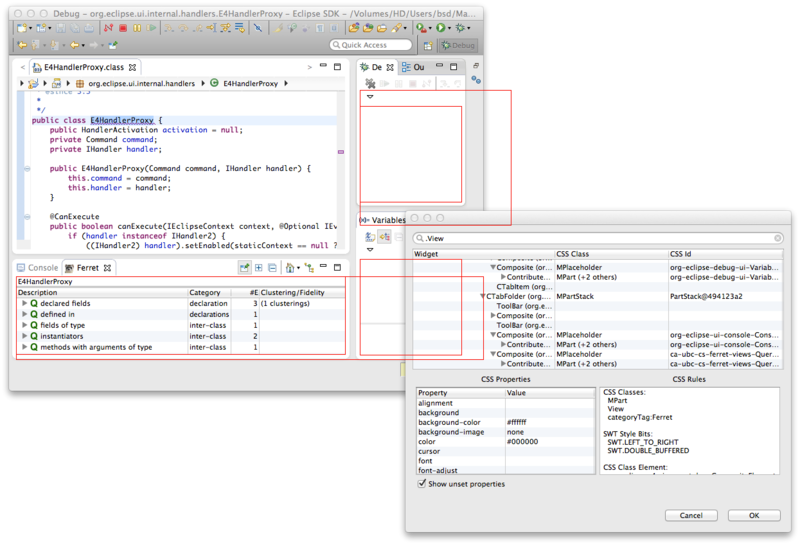 How can I do it without defining shortcuts in my application model? The spy is opened through the “org.eclipse.e4.css.OpenSpy” command — you can trigger that in whatever way you like. You can also trigger it through the Quick Access bar. BTW: could you expand on what’s bad about the shortcut? On Windows, it’s uncomfortably close to “alt-F4”, which closes applications. I bet it’s also swiped as a global hotkey for various graphics drivers, etc. I agree, it’s probably best opened through the quick access bar. On Ubuntu, I’d *really* like to see this integrated with the HUD menu – that would make everything quick access at a single keypress. didn’t run at windows. Shortcur Alt-Shift-F4 exits the application. It seems Windows intercepts Shift-Alt-F4 You’ll have to rebind the keystroke, unfortunately, or invoke the Spy from the Quick Access field. I’ll look to using a different keystroke. Is it possible to use CSS Spy with RCP based application? How to configure it? 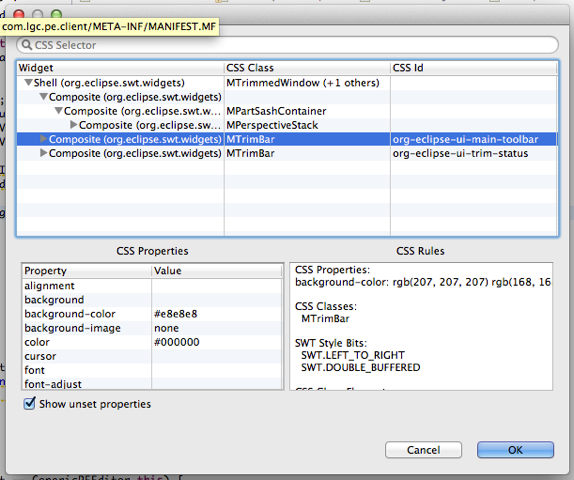 Suppose I have to add a plugin dependency for css spy … any hints? The Spy is self-contained in the org.eclipse.e4.tools.css.spy bundle. It uses a model processor for automatic installation on startup. Is it possible to get the spy list properties of my RCP? I have a E4 RCP which I launched and I want the CSS Spy to list the parts of my RCP. How to do? Should I add the bundle to my product? The CSS Spy lists all SWT properties applicable to a widget, not parts. It may seem a semantic quibble, but we actually have a prototype CSS engine that operates directly against the modelled workbench parts too. You can select the widgets that correspond to modelled workbench pieces through class selectors. 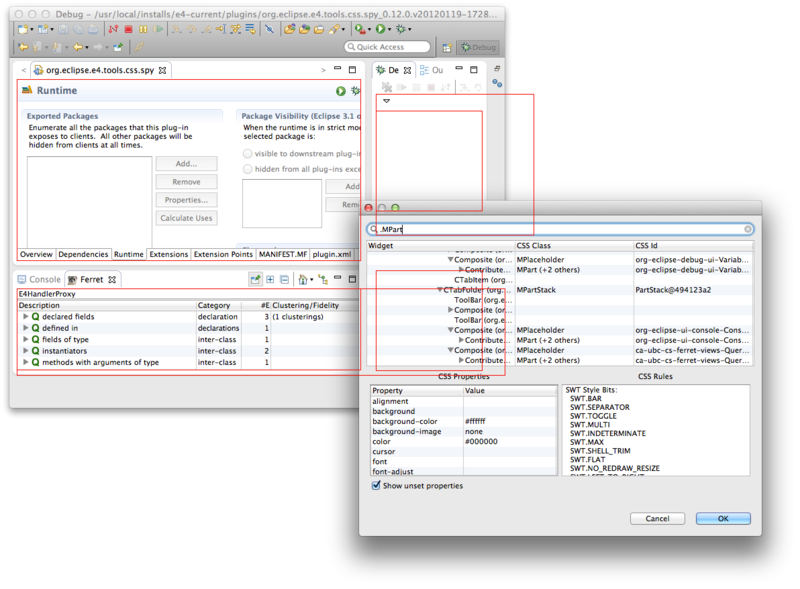 For example, the widgets for MParts are selectable by “.MPart”. You can then look at the properties shown for each of those widgets. Oh and yes: you need to include the spy bundle. Not sure I’d want to ship it as part of a product though. If you need to run it in a deployed app, use the p2 director to install it from the command-line. I will not ship it but I want to inspect the properties of my RCP. This is what I did – I added CSS Spy feature to my target and added e4.tools.css.spy as a dependency to the plugin where I have the Application.e4xmi. The usual Alt+Shift+F5 didn’t work and I thought of adding the OpenSpyHandler to one of my commands but the class selection dialog for the e4xmi form editor doesn’t show me OpenSpyHandler at all. Should I open the CssSpyDialog from my handler or do something special? I think there is some magic in SpyInstaller but I can’t understand much. Have you posted this in some other place?